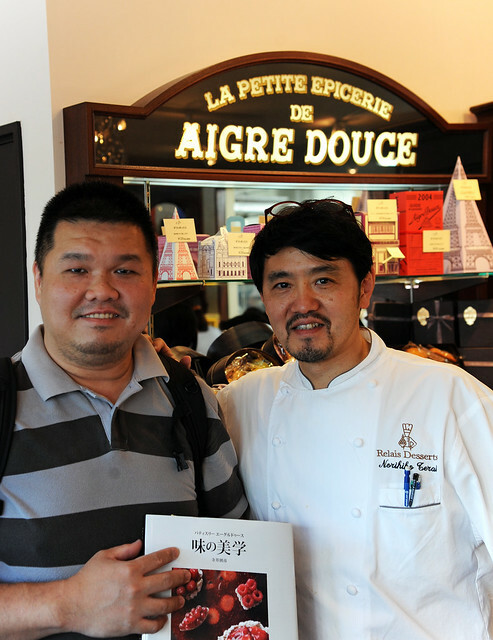 Patisserie Aigre Douce エーグル・ドゥース is helmed by Chef Norihiko Terai who was part of the Japanese team who came in first runner up in the prestigious Coupe du Monde de la Pâtisserie in 2003 at Lyon France. 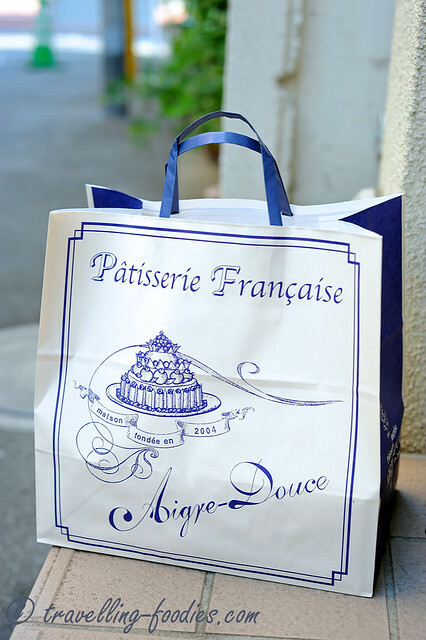 Like many great Japanese patissiers such as Hidemi Sugino and Hideki Kawamura, he polished and honed his skills in France in his younger years before coming back to Japan and opened Patisserie Aigre Douce a year after his stint at the Coupe du Monde. 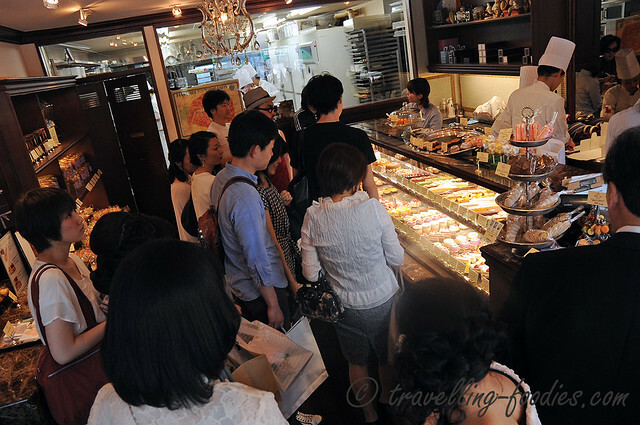 The pastry shop lies in the northern districts of Shinjuku ku and is within walking distance from Mejiro JR Station on the Yamanote line. On the day we visited, the shop was already packed with customers who were all waiting patiently for their orders to be taken and packed. There is very little seating within the shop itself and looking at how busy it was, it didn’t seem conducive for us to dine in so we opted for takeaway as well. The little blue and white paper bag that held our hopes and dreams… just kidding! 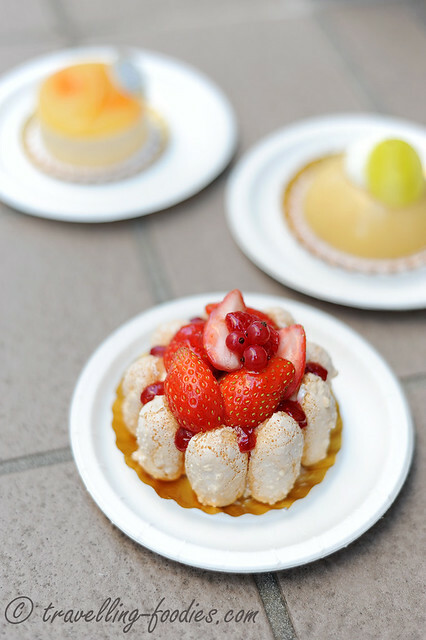 We chose a small selection from their wide range of cakes and pastries available. 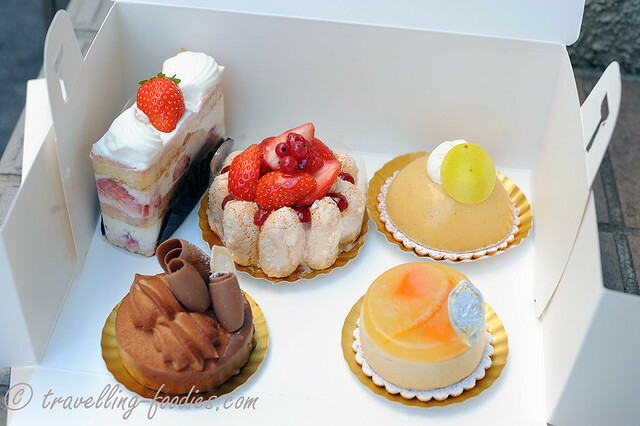 We counted close to a dozen different types of petit gateaus and entremets in the chiller display with more petit four secs like macarons, sables, and madeleines on the shelves, and of course the long and slick gateau voyage which Patisserie Aigre Douce is well known for. 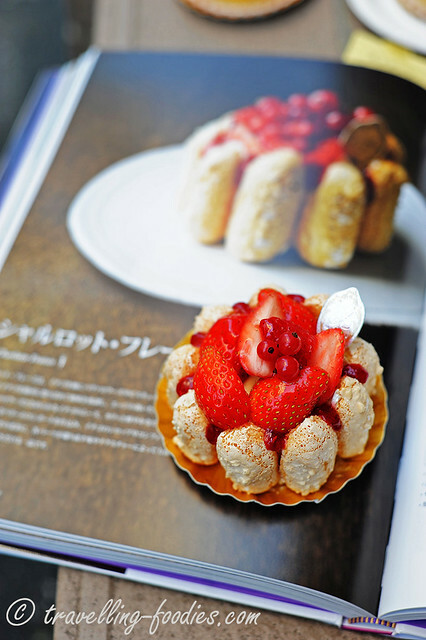 Chantilly Fraise – The very popular and all-too-familiar strawberry cake. 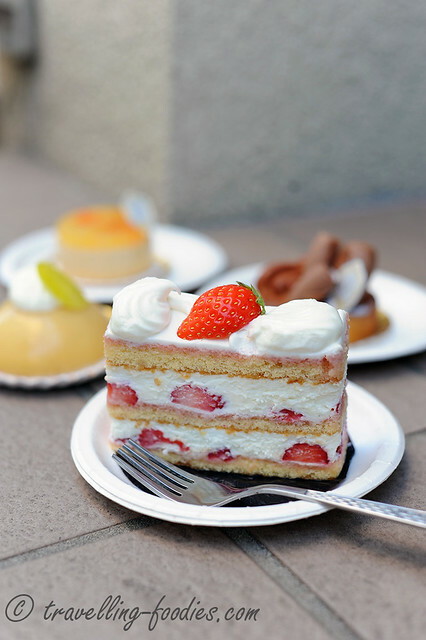 Like I’d mentioned, Chef Terai stuck with the more traditional composition of the French “Fraisier” using genoise for the layering vis-a-vis the Japanese version of “ichigo shoto kekii” that uses a much softer souffle sponge. This rendition is very straightforward but no less delicious. Though the components are simple, the piece was very well executed. Very generous with the fresh strawberries embedded within the soft and silky creme chantilly as well, cutting the strawberries into halves instead of thin slices as we see in some other places. Charlotte Fraises – Another strawberry themed creation using genoise aux amandes as the base and biscuit cuillere to form the perimeter in which lies a mousse aux fraises over the thin layer of genoise, then a gelee like layer of compotes aux fruits rouges and finally a creamy slather of bavaroise, before being embellished with fresh strawberries and some red currants on top as well as confiture aux fruits rouges seeping from the sides for dramatic effect. The entire piece tasted very refreshing and light, singing the flavours and moods of spring. Great work on textural contrast as well with the soft and creamy bavaroise against the slightly crunchy ring of ladyfingers. 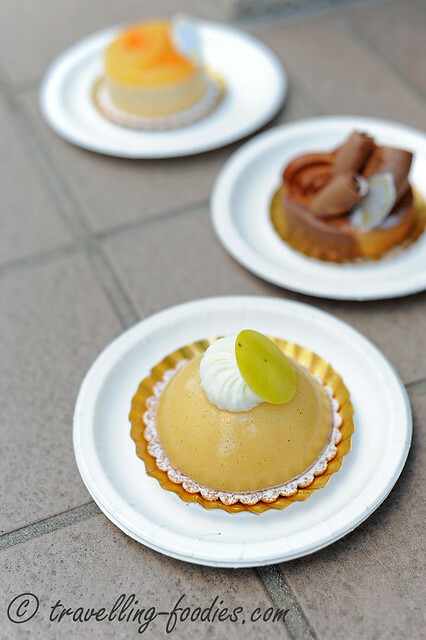 The Gateau a la poire has a crisp piece of sablè as a base which was used to support a bavaroise au poire layered by biscuit joconde and finally a gelee au poire that robed the exterior to form a dome. It was pleasant but somewhat lacking in the vigour of the earlier Charlotte. It was sightly on the sweet side (as with most traditionally made French pastries) yet somewhat lacking in the “pear” component which is the central theme of the piece. Some bits of william pear compote perhaps would have added more textural dimension I though. Salted Caramel and Chocolate Tart – This is a beautifully constructed tart with very distinct flavour and textural profile. The pate sucre base was delightful crisp and had much character on its own, one of the very well-made tart shells we have had. The bottom of the tart was filled with salted caramel whose robust flavours have been pushed almost to the limits, both bitter and savory at the same time. The toasty notes from the chopped nuts added depth to the overall palate sensation. 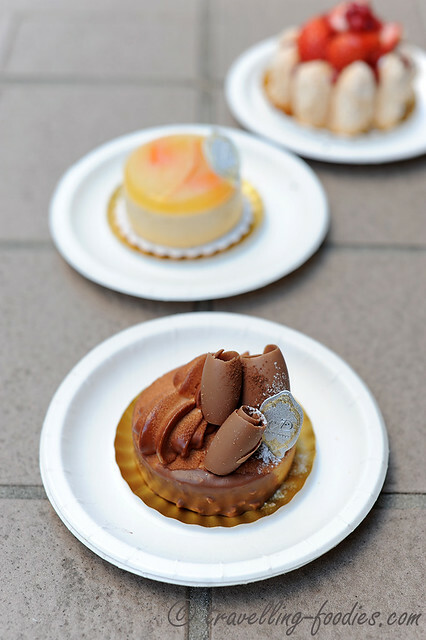 For very good contrast, milk chocolate mousse was used to fill the rest of the tart, whose sweetness actually accentuated the bitterness of the caramel layer. This piece has so much more going on within the nut(ty tart) shell quite literally compared to the earlier gateau a la poire which somewhat pales compared to this rather unassuming looking chocolate and caramel tart. One of the best chocolate and caramel tarts we have had in a long time. Couldn’t miss the opportunity to have a photo taken with Chef Norihiko Terai and have my copy of his recipe book autographed of course! On the whole, a fine display of very decent pastry making for us. Yes his creations may not have some of that “fusion” “east meets west” kind of assemblage that one may expect of Japanese pastry shops, but he makes up for it by a good showmanship of his understanding on ingredients and pastry technique. 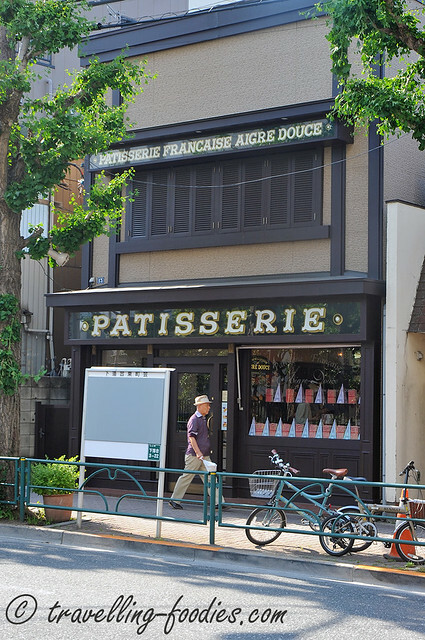 For folks looking forward to find matcha in your cakes or adzuki in the mousse when you visit Japan, Patisserie Aigre Douce is obviously not the place for you. 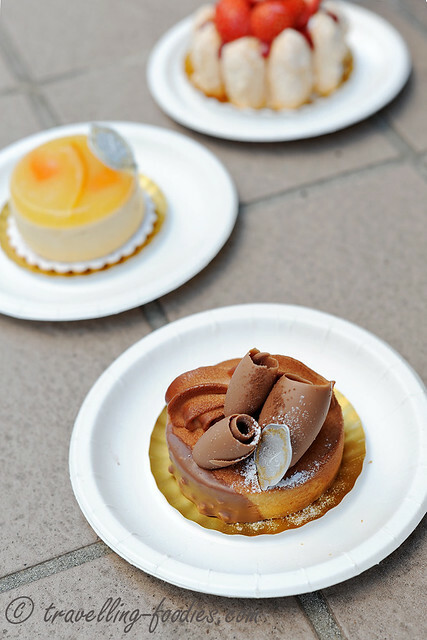 But if you are looking forward to experience some solid French pastry making, I think you are in the right place. This entry was posted on June 6, 2018 by Alan (travellingfoodies). 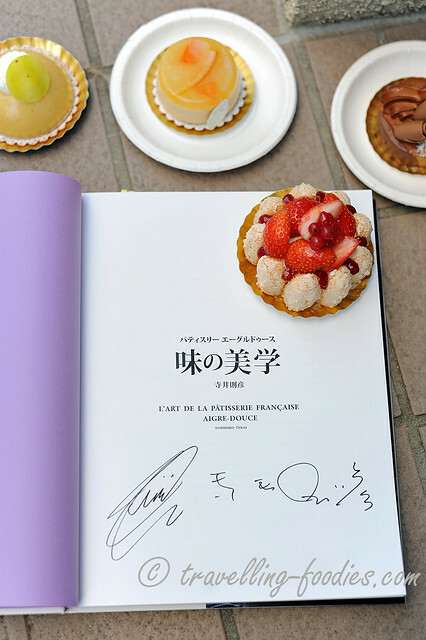 It was filed under Food, Travel and was tagged with charlotte aux fruits rouges, chocolate tart, Fraisier, french pastry, japanese pastry, mejiro, Norihiko Terai, Patisserie Aigre Douce, Tokyo. Thank you for your many lovely recipes sharing. Hope you can help me with a couple of questions. I did a search for the Pate Sucree de Cedric Grolet…. 1) May I know what flour did you use as it was translated to Flour T55? 2) The translation for the handling of the pastry read: “In order for the dough not to shrink it must crust overnight in the refrigerator in the mold or circle. If you are in a hurry, you can freeze the mold for at least 25 minutes. My pasta never shrinks yet I do not sting and I do not put dry beans.” Is it we press the pastry into the mold and freeze overnight before baking? And if in a hurry, to freeze the pastry that is in the mold for minimum 25 minutes before baking? Freezing the pastry will prevent shrinking and there is no need to use any dry beans. Thank you and wishing you a blessed weekend!